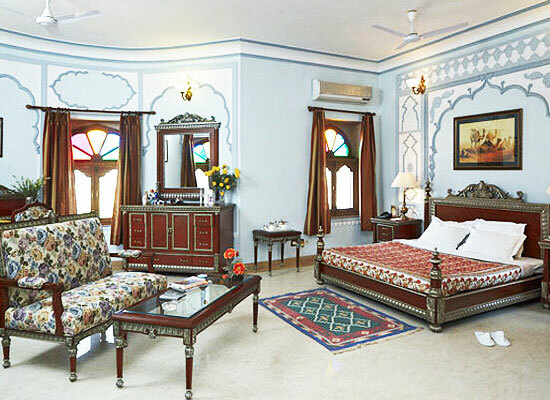 "Nestled in a small hamlet with the same name, Khimsar fort is one of the best luxury heritage hotels in Rajasthan. The property spreads over 11 acres of lush land and has huge courtyards and orchards, making it an interesting setting, amid sand dunes. Founded way back in the 15th century, today this heritage hotel is a winner of a number of accolades for offering a royal stay, with world-class comforts. The hotel has luxurious rooms and huts as accommodation, serve the finest of food and beverages, and has all the modern comforts. The interiors, exteriors and services are all lavish. 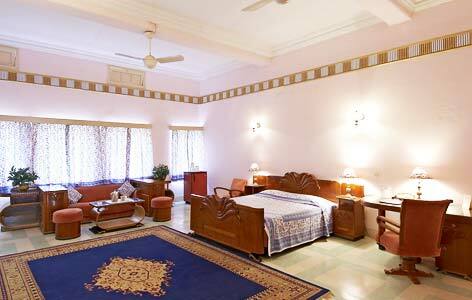 The hotel is around 90 km from Jodhpur. 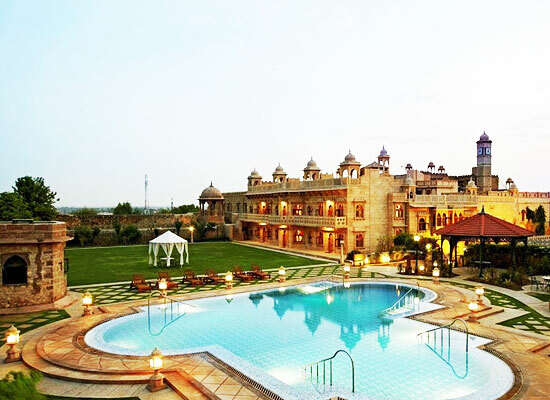 The Khimsar Fort, now a premium heritage hotel, was constructed by Rao Karamsiji, the 8th son of Rao Jodha, the founder of Jodhpur. The construction of the fort began in the year 1523. Later, a zenana (ladies) wing, and a private regal wing built by Thakur Onkar Singh for himself. A part of the fort still forms the residence of the royal family of Khimsar. 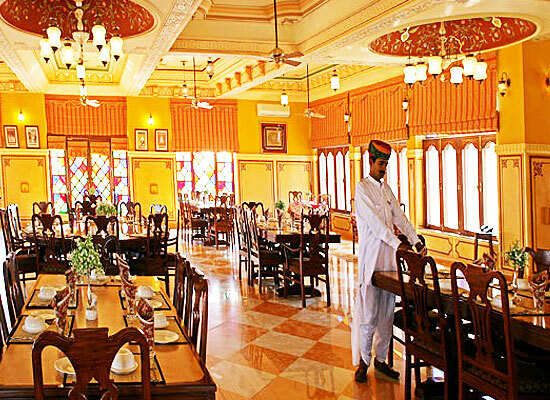 Khimsar Fort Dining options are as charming as the heritage hotel. Offering a variety of Indian and International cuisines, specializing in local Rajasthani gastronomy, dining here is an experience you never forget. Dining facilities are available in the hotel amid the sand dunes, by the bonfire, along the pool and other charming setting. The names translates to ‘family lineage’ in local language and is in fact the legacy of the Khimsar Fort. The restaurant continues with the fine legacy of mouthwatering Rajasthani food. The décor of the restaurant are portraits of the 20 generations of the ruling family. Dine in regal splendor, as the buffet breakfast, lunch and dinner served here showcase the best of cuisine. The unique name and the unique setting offers the chance to savor A la carte menu with dishes from around the world while enjoying views of beautifully hand painted decor. Choose from a mouthwatering variety of salads, sandwiches, snacks, classic continental delights or traditional specialties. One of the best in Khimsar Fort, dining at Fateh Mahal & the Fort Ramparts is romantic and memorable. The very best memory is without doubt, a candle lit dinner. Lose yourself to the pleasure of savory delights while enjoying the reverberating sounds of drums and folk dances, warming up by the bonfire. The bar is blended into the old stables overlooking the swimming pool, hence its name. The craftsmanship of unique 'Araish' Mughal limestone art walls, sets the charming setting of an evening on high spirits. Choose from the best of international wines, spirits, and cocktails concocted from the best times of the British Raj. The traditional setting of Khimsar is a perfect spot to dine, relax or regale some wonderful moments. 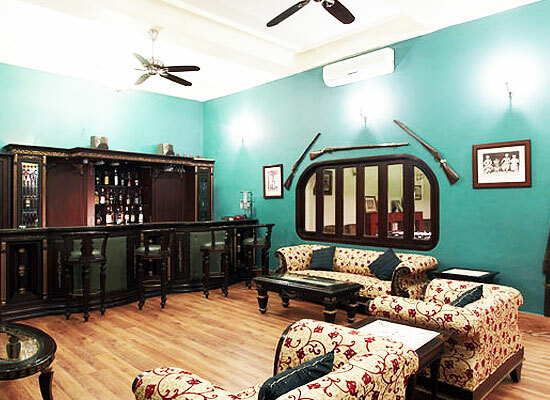 Antique guns and portraits are adorned on the walls of the lounge. Discover a variety of wines from the cellar or split a "Thakur's Fury', a cocktail recipe from the times of the Raj or variety of snacks and drinks served on request. Khimsar is part of the Nagaur District that lies between Jodhpur and Bikaner. The Nagaur Cattle Fair is famous among both tourists as well as the locals.